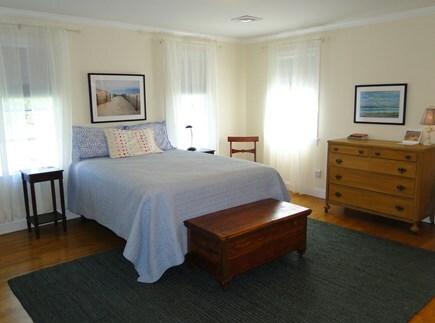 Spacious, private home central to bay and ocean beaches. Brand new outdoor shower – best after the beach! 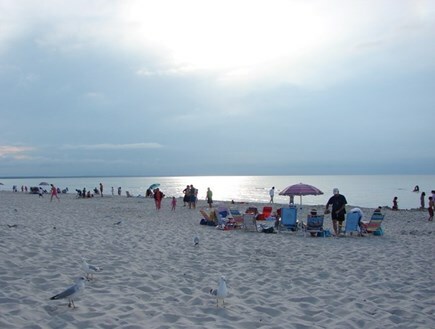 Enjoy the day at Mayflower beach! Here you'll find a lovely 3-bedroom, 2-full bath, house at the end of a cul-de-sac and in a great neighborhood and location. Central air conditioning is throughout. A large living room, open kitchen and dining room welcome you to gather with family or friends. One-floor living provides a large master bedroom and private bath on one side of our home, with guest bedrooms and bath on the other side. A bright sunroom opens to a deck with landscaping all around. There is a new outdoor shower and fenced-in back yard. 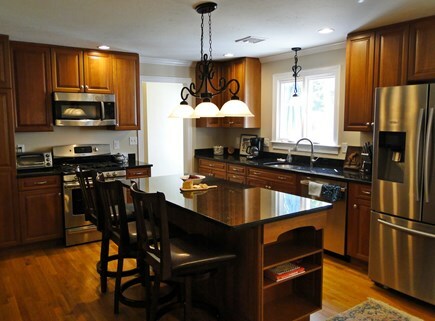 The kitchen has granite counters and stainless appliances. There are hardwood floors throughout our home. All appliances are gas including a gas fireplace and an outside grill. There are two HD, flat screen TVs and cable/WiFi and sound bar. Yarmouth has two distinct sides. Off Route 28, the ocean side, are Smuggler's and Sea Gull Beaches. This is where family fun such as an inflatable park, mini-golf, and family restaurants prevail. 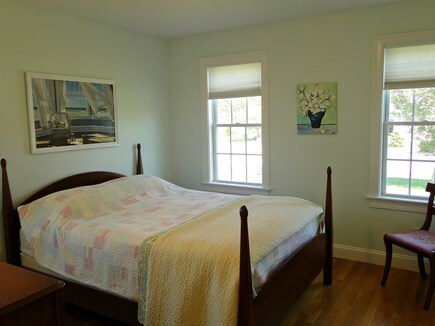 The Bay side, off Route 6A, offers historical homes, small quaint shops and Mayflower and Corporation Beaches. 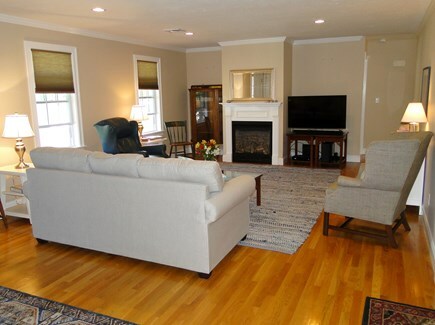 Our house is 4-5 miles from either side and provides many choices. 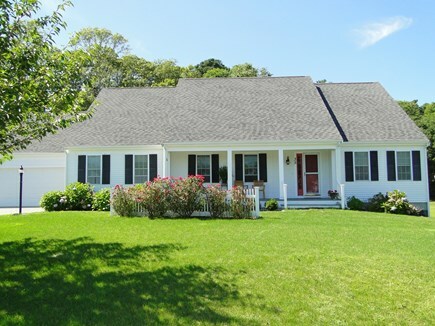 In Hyannis, 6 miles away, you can get a ferry to Martha's Vineyard or Nantucket Island. Additional pricing info: There is a monthly discount of $425.00 per week if a party rents for the entire month, State and local taxes of 14.45% will apply. There are two steps into the house with extra handle at door for stepping up and in from the garage. 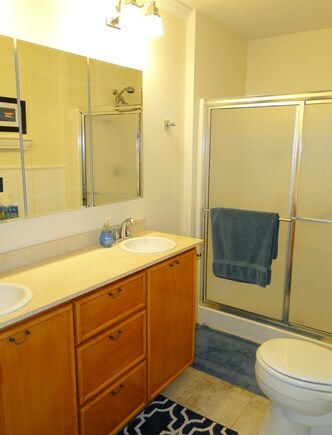 Master bath has step-into shower and optional seat and hand shower and railing for support. My husband and I have stayed in a number of places that did not meet the expectations written in the ad. (Our daughter-in-law made the reservations for my husband and I, as well as her husband and two kids.) This home, however, more than met the description. A beautiful, warm and comfortable home that is near everything. 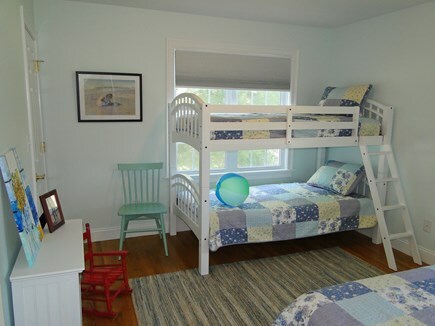 It’s a tall order to accommodate four adults and two small children and this home did it beautifully. 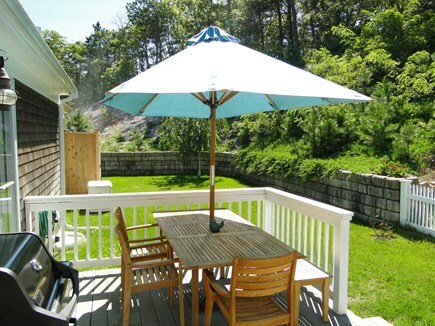 Beaches are a short drive, so are restaurants, kid attractions, Stop and Shop and the bike trail. The street is a cul de sac which is perfect for the grandchildren and good for walking with the kids too. All the amenities were there (towels, shampoo, etc.). By the way, there's a two-car garage! Thank you for your kind thoughts! You took great care of our home and we welcome you in a heartbeat next year. Katie's young daughter, "Thank you. We had so much fun. Love the M's" Her mother added," Sign us up for a week next year!" Our family has always come to the cape for summer vacation and for enjoying the beach. Now, our family includes grandchildren who are exploring these beaches for the first time. The beaches close to our home are perfect for a three and five year old to splash, swim and learn about the tides, shells and building sand castles. Until now, we have been renters and so we know what is needed to make a great stay such as central air, grill, TV for rainy days. We have included all that made us feel at home but with a new, exciting place. That is what we want for you- a comfortable home for an exciting stay. Our neighborhood hosts beautiful homes, friendly neighbors and our house is located in a cul-de-sac. 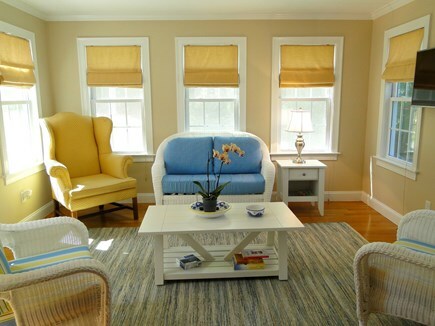 We love the spaciousness and the privacy. The children can ride bikes freely. We love to be able to easily try so many beaches that are only 10-15 minutes away. We have had gatherings of family and friends with room for all. Yarmouth really is mid-cape. We are so close to either side of the cape! Sometimes we want to walk and wade so we pick Sea Gull Beach and sometimes we want to see the sunset and so Mayflower beach calls us. We have family restaurants within 5 minutes for pizza, seafood (lobster rolls) or hamburgers. There are also places such as The Yarmouth Inn which is historic and has fine dining. For me, I love the open market, cultural center and library where they bring in local writers. Body surfing at the national seashore is also our love where waves are animated and energetic which is more likely there than at the bay beaches. Fun is all around.